The Swift M5 Series is ideal for educational and medical student applications. This series features the Siedentopf body. There is a choice of monocular, binocular or trinocular configurations. All the bodies are inclined at a 30° and rotatable 360°. DIN wide field 10x eyepieces are standard on all models and have a 20mm field of view. One distinguishing feature of this series is the large research level mechanical stage that accommodates up to two slides at a time. The series has modular versatility featuring binocular and trinocular models with phase contrast featuring the patented Quodmaster phase condenser. There are several grades of optics available including Achromat, Semi Plan, and Plan Infinity. The illumination system is 6v 20w halogen with variable light intensity. Focusing is achieved with a precision coaxial coarse & fine adjustment mechanism that has all metal internal parts with high grade synthetic lubricants. The finish is acid and regent resistant. This microscope comes with a manufactures lifetime warranty. 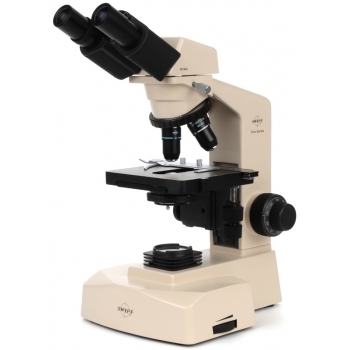 Click the button below to add the Swift M5 Microscope Series to your wish list.